Yogyakarta and Solo are the centers of traditional of batiks, as the north coastal town of Pekalongan is the center of more modern batiks, using more floral and birds motifs. 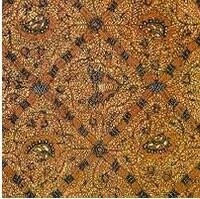 There are some well-known artists of batik design in Yogya and Solo, as well as some big batik manufacturers with famous trademarks. The growing production of batik makes way to the establishment of mori (woven cotton fabrics) factories in Yogya and Central Java. 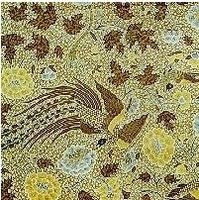 The Batik research Institute was founded in Yogya. Informal Dresses; It is a free choice, usually for daily casual wear. Formal OccasionsIn some parties, as a state banquets, receptions, etc, the invitees are requested to wear batik. Long sleeves shirts for the men and 'kain batik' (long batik to cover the lower body) for the women. Traditional OccasionsIt is worn to present the traditional wedding ceremonies, special ceremonies for the Royal families, etc. In a wedding ceremony the bride and the bridegroom wear the same motif of batik Sidomukti, symbolizing a happiness and prosperous life. Using the same motif symbolizing the togetherness. The parents of the bride and the bridegroom wear batik with motif of Truntum, symbolizing the advice of the parents to the newly weds to enter the new life with full of love and confidence. Kebaya, It is a traditional long sleeved shirt (the material used is not from batik, usually from silk and other fine materials). Selendang, It is used as attractive piece of clothing to co mpliment the traditional dress. The 2 m x 0,5 m selendang cloth hung over one shoulder. Kemben or Semekan, It is special for ceremonies in Karaton (palace) or Royal family ceremonies. Instead of wearing Kebaya, to cover the upper body, a kemben is worn. Jarit or Bebed; Men kain panjang, tightened with stagen. Surjan; Men traditional long sleeved shirt (only for Yogya style) and the material is not batik. Beskap; Instead of wearing surjan, the men wear a coat (beskap of Solo style or Atila of Yogya style), the materials is not batik. Blangkon; It is a headgear made from batik. KerisThe dagger is worn at backside of the waist, as a compliment to the dress. Is a very long jarit to cover the lower body. It is worn only on a very special occasion such as the king coronation by the king himself. The wearing of dodot or kampuhan is very complicated. It may take two hours to wear a dodot with the help of specialist-dressers!